When you work in customer service and you’re dealing with an angry customer, it’s likely the last thing you feel like doing is giving them a hug. However, this is exactly what founder of Convince and Convert and author Jay Baer encourages you to do to improve your customer relationships. 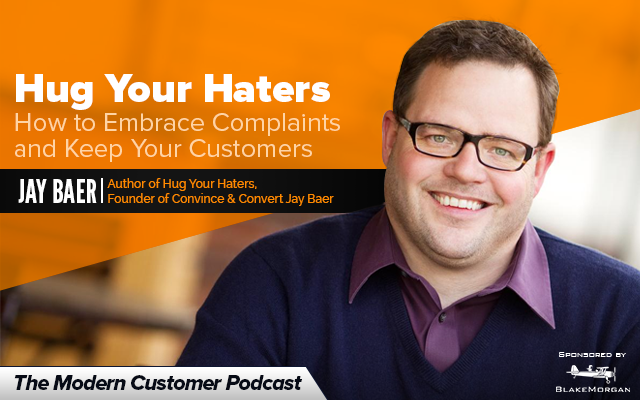 Baer’s newest book is Hug Your Haters: How To Embrace Complaints and Keep Your Customers. In the book, Baer gives many examples of the various ways customer service has changed in today’s digital environment. Some of the challenges companies face include when “mom says yes and dad says no.” When many companies do not have a good grasp of basic customer service, is it a surprise that many of them are struggling with social customer service? Baer says, “We’re creating social media problems for ourselves because we’re not good at legacy customer service. Someone calls and it’s a 30 minute hold, or an email is sent and there’s no response for two days. Then they take it public—taking something that should have been easy to solve.” According to Baer, 71% of all social media complaints started on another channel. Brands have enjoyed the privilege of control for 1,000 years. In the past it was only phone or email or in-person interactions—since the caveman days. Baer says—because of social media—customer service is a spectator sport now.